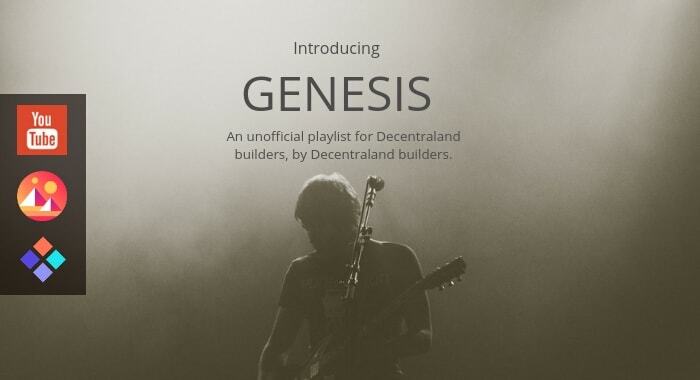 In only a few weeks time, hundreds of Decentraland builders worldwide will come together like never before, to collaboratively contribute to a new virtual city rising up from the blockchain. Rome wasn’t built in a day, nor was it built in silence. Very soon, countless hours will be spent online building once the Decentraland drag and drop builder is released in March 2019. This is a global building effort like never before, bringing together an eclectic range of people from all countries, cultures and backgrounds. Let’s celebrate this with music! DCL Plazas is creating a fun and collaborative music album / playlist, inviting everyone to submit their favorite songs for everyone to listen, share, motivate and enjoy whilst building. 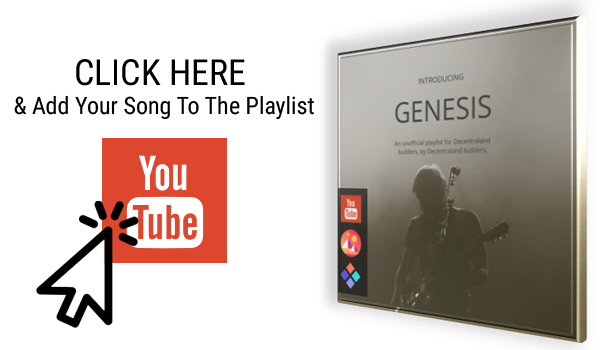 The album / playlist, named Genesis, is available here on YouTube for anybody to access and listen to whilst building. To contribute, either click on the button below, or add a YouTube song link in the comments below. Please note: You must be logged into YouTube to add to the playlist.